Just few hours to go, and then we will be seeing the Google at its Google I/O 2013. Just ahead of the conference, we are seeing lots of updates coming to Android and other Google Platforms. 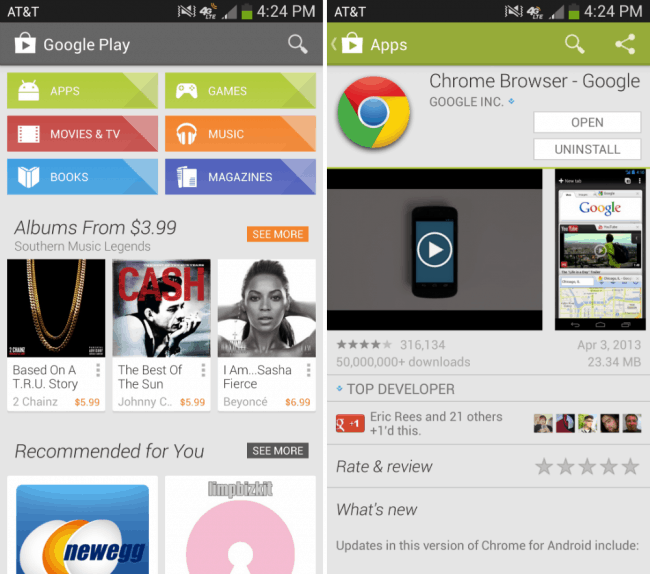 Google Play Store has reportedly received a silent update from Google ahead Google I/O 2013. The update carries a little user-interface changes on the devices. The new Google Play tweaks the way icons for different categories show on devices. It improves the apps, games, movies & TV icons in the application. The Google Play Store update goes available for everyone around the globe, and it is identically spotting an extra space between the ‘Install’ and ‘Uninstall’ button. The extra space makes it way in the application to avoid users from installing unwanted applications or to prevent unwanted acts in the Google Play Store. Furthermore, there are words that Google is rolling out major update to its Android platform at Google I/O 2013, and Google Play Store will also be getting major updates. However, the latest Google Play Store design comes up with a little tweaks to current user-interface of the devices, and personally we are yet to receive this update. We got updates from the Android Police, who firstly spotted the update. The latest Google Play Store update will be reached soon to everyone, as it takes sometimes to approach million of devices around the globe.